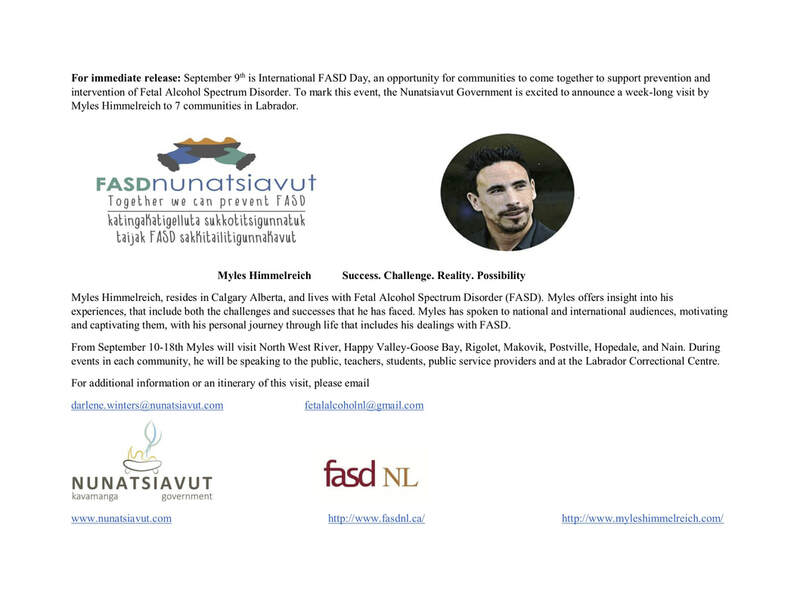 fasdNL renews call to government to address alcohol policy & FASD in NL. 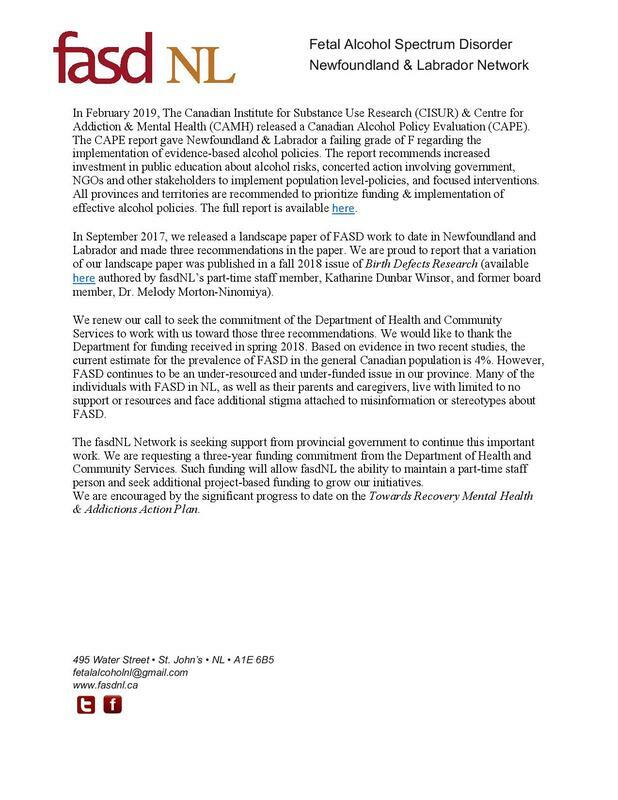 In September 2017, we released a landscape paper of FASD work to date in Newfoundland and Labrador and made three recommendations in the paper. We are proud to report that a variation of our landscape paper has been published in the October 2018 issue of Birth Defects Research (available here authored by fasdNL’s part-time staff member, Katharine Dunbar Winsor, and former board member, Dr. Melody Morton-Ninomiya). We renew our call to seek the commitment of the Department of Health and Community Services to work with us toward those three recommendations.We would like to thank the Department of Health and Community Services for funding received in spring 2018. Based on evidence in two recent studies, the current estimate for the prevalence of FASD in the general Canadian population is 4%. However, FASD continues to be an under-resourced and under-funded issue in our province. 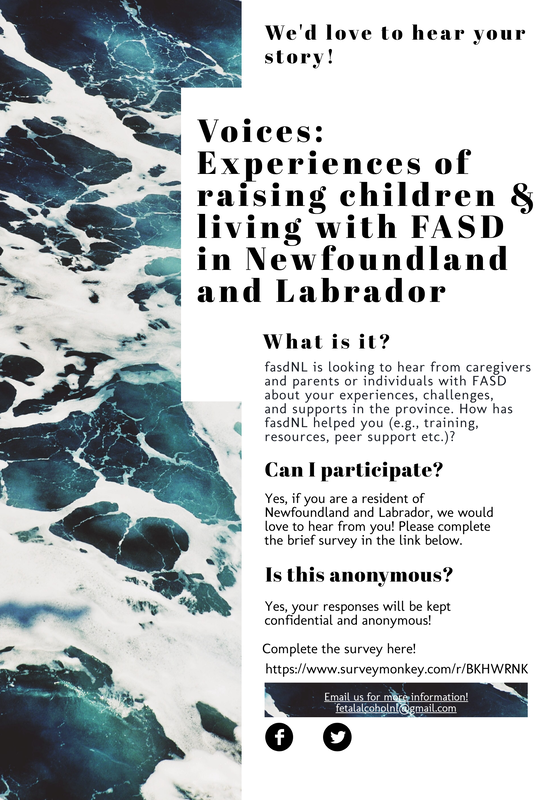 Many of the individuals with FASD in NL, as well as their parents and caregivers, live with limited to no support or resources and face additional stigma attached to misinformation or stereotypes about FASD. 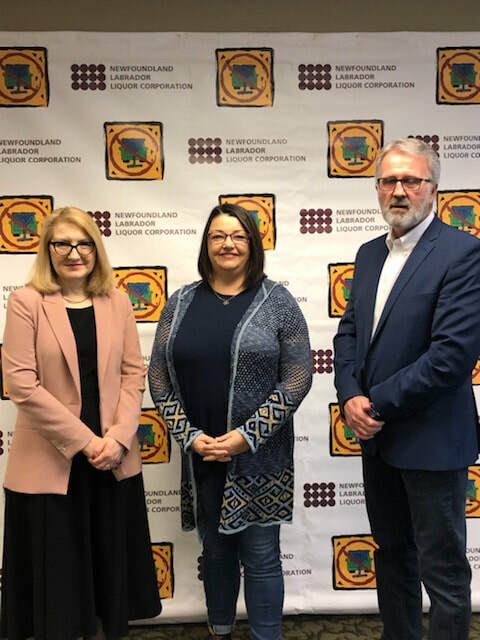 The fasdNL Network’s mandate includes addressing FASD awareness, prevention, intervention and support initiatives across the province while forwarding the conversation about diagnostic capacity within all regional health authorities. fasdNL directly offers FASD training to professionals, parents, and caregivers from all regions – to over 600 participants throughout the province in 2016-18. We also offer virtual support networks, private electronic chat groups and direct support to parents and caregivers. Please see our 2017-18 Annual Report enclosed. In order to give voice to parents and caregivers, we asked them to share their experiences with us - to tell us about how they seek support and about their continued struggles and needs. And in an effort to take stock of our training and gaps, we collected feedback from FASD 101 participants. Please see the enclosed report titled Shining a Light on FASD in NL. Since its formation in 2013, fasdNL has operated on limited project-based funding, supplemented by fundraising efforts and donations. However, these funding strategies are not able to sustain the delivery of prevention, intervention, support or training work in the province. At this point, fasdNL is at risk of losing our only part-time staff person who coordinates the majority of our initiatives. 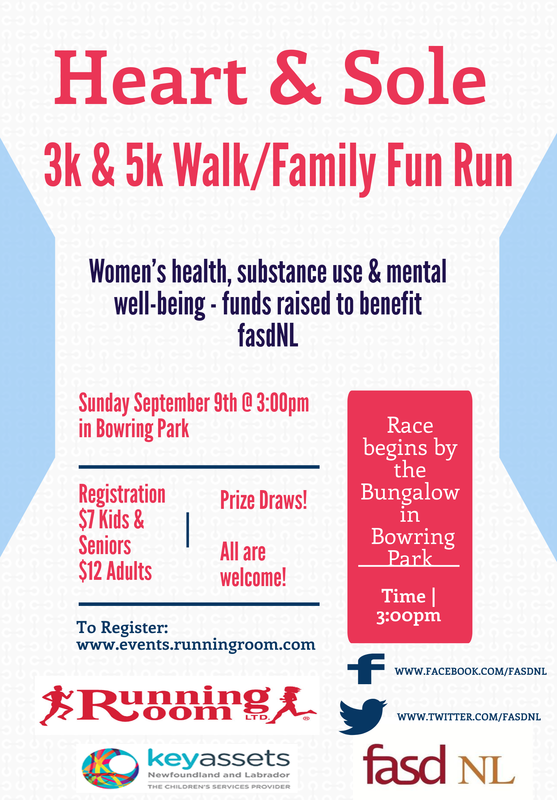 The fasdNL Network is seeking support from provincial government to continue this important work. We are requesting a three-year funding commitment from the Department of Health and Community Services. Such funding will allow fasdNL the ability to maintain a part-time staff person and seek additional project-based funding to grow our initiatives. We are encouraged by the significant progress to date on the Towards Recovery Mental Health & Addictions Action Plan. We have requested the opportunity to meet and discuss in further detail with members of provincial government. 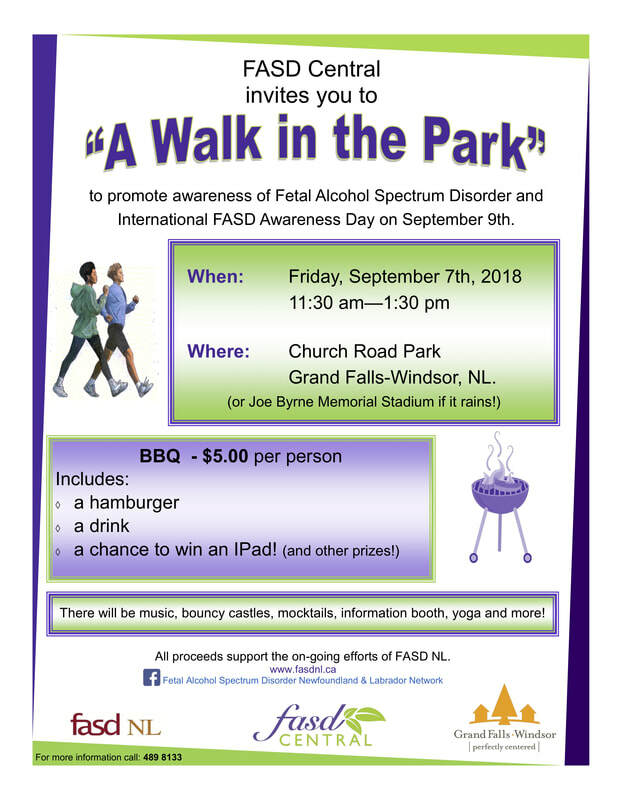 The fasdNL Network is a pan-provincial organization that educates, networks and shares resources to improve the lives of individuals, families, and communities affected by FASD. Individuals with FASD are at increased risk to experience challenges with mental health, housing, poverty, education, employment and criminal justice involvement throughout their lifetime. Are you a parent/caregiver of an individual with FASD or have a diagnosis of #FASD and live in Newfoundland and Labrador? 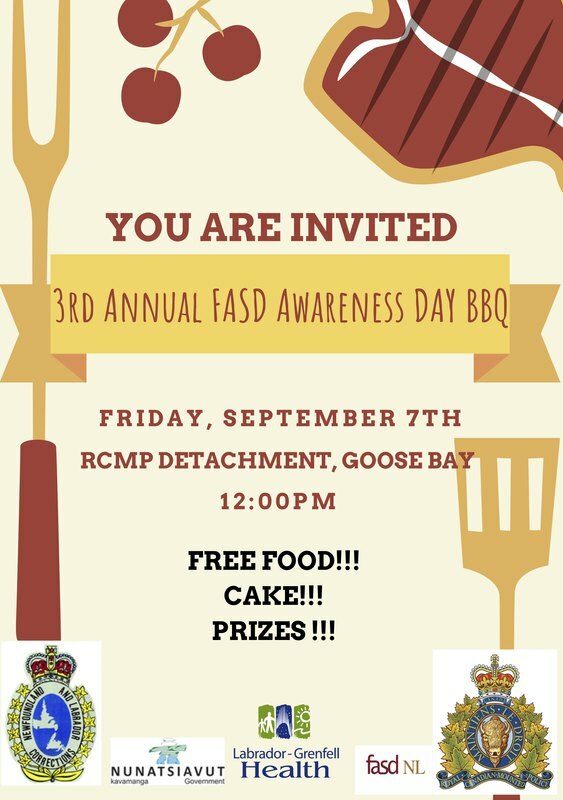 To increase awareness of FASD day and raise funds for fasdNL - Please find information below for our regional FASD day events! 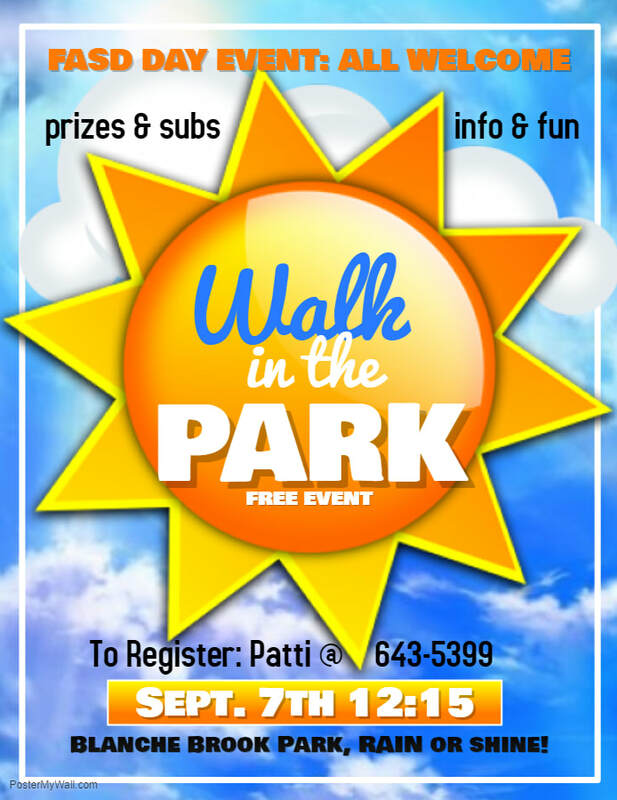 Registration for the 3rd annual Heart & Sole Walk & Family Fun Run in Bowring Park for International FASD Day is now open. Join the fun by registering here. More information, sneak peaks of prizes to be won and invite your friends and family by visiting our Event on Facebook here. Are you interested in becoming an #FASD 101 trainer? Do you live or work in the Western region? fasdNL is offering FASD 101 Train the Trainer in Corner Brook on May 31st. Email fetalalcoholnl@gmail.com for additional details! 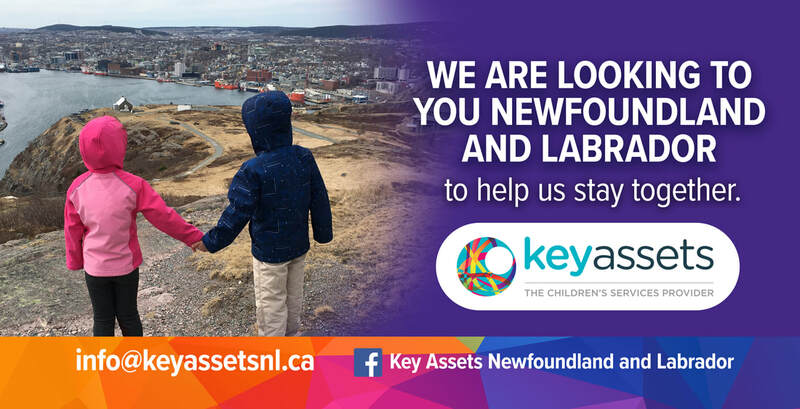 Key Assets is looking for families across Newfoundland and Labrador to provide therapeutic care to children and youth in our family-based care program. Carers will provide a child with complex needs the opportunity to live in a supportive and nurturing family environment. A generous care allowance is provided, along with ongoing training and extensive supports.